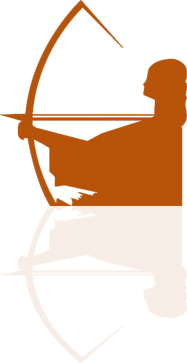 ARTEMIS ADVENTURES: I'm all a flutter! Last night I felt my second fluttering of the baby and it was very exciting. It has been about 2 1/2 weeks since the last one...and this one was more like a kick. It was so neat! I'm glad I was awake for it since it lasted only a couple seconds... I still can't believe there is a little person in there! I'm 19 weeks along, today. 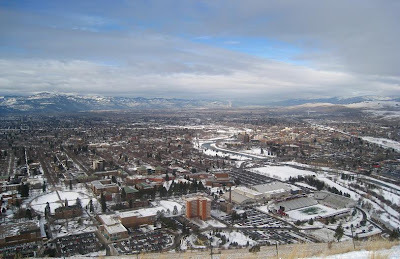 Here is a photo I took while on the trail today for a short hike with a friend at lunch ~ overlooking my beautiful Missoula! Hope you are able to get outside to feel the cool winter air in your lungs today! "What a beautiful day!" Oh the many more flutters you will feel! I can't wait! I still remember when we were at the Cozy Corner for dinner and everyone was feeling my belly when Wilson was in there! Oh how I miss that feeling...enjoy it...it doesn't last long enough!!! !